Andy Murray clinched the Vienna Open title on Sunday with a 5-7, 6-2, 7-5 victory over David Ferrer, one of the Briton's main rivals in the battle to qualify for the ATP World Tour Finals. Murray is now eighth in the Race to London standings, with the top eight players qualifying for the prestigious season-ending tournament from Nov. 9-16. He is one place and 110 points ahead of Spain's Ferrer. The victory was Murray's first over a top-eight player since he won Wimbledon in 2013 and handed him revenge for his third-round defeat to Ferrer at the Shanghai Masters 10 days ago. 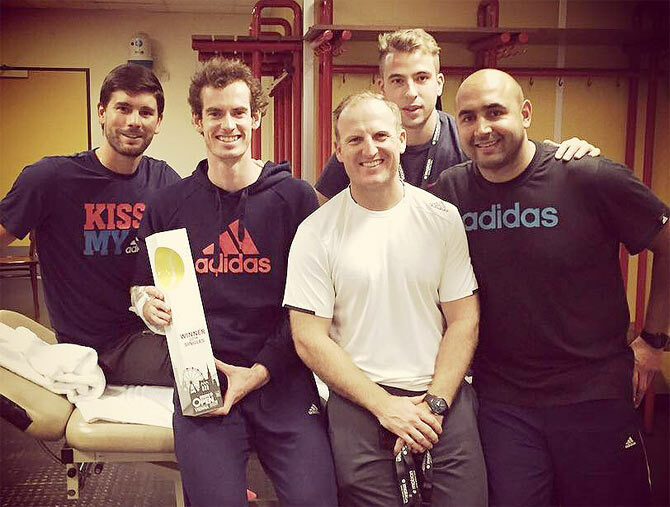 "It was a good finish to the week," Murray told the BBC after wrapping up victory in two hours and 41 minutes. "Obviously, it was an important match in the race for the Tour Finals in London and it was a very, very tough match but I managed to get through it. "It was a very long match and both of us were in the locker room struggling, limping around and very stiff and sore so it was a nice one to get through." Murray's next tournament will be in Valencia with 500 ranking points on offer, before he travels to Paris where there are 1000 more up for grabs. Croatian second seed Marin Cilic overcame Roberto Batusta Agut 6-4, 6-4 to claim the Kremlin Cup crown on Sunday, while Russia's Anastasia Pavlyuchenkova lifted the women's title. World No. 8 Cilic, who already had a place at the ATP World Tour Finals in London, faced few problems against his fifth-seeded Spanish opponent but did have to save six break points. "I had to work really hard today as their were a lot of hard rallies," said the U.S. Open champion, who won in an hour and 24 minutes. "I thought I served better than yesterday and I played well from baseline," added the Croat who fired 10 aces. "This title is another step in my career. Of course, I am delighted, this win will have a special place in my heart." Pavlyuchenkova clinched a seventh WTA crown and second title this year by beating Romanian Irina-Camelia Begu 6-4, 5-7, 6-1. The sixth seeded 23-year-old, who won in Paris in February, was pushed to the limit before claiming the title in two hours and 29 minutes after struggling to hold serve. The victory will take her up to 24th in the world rankings. "I could not have thought of a better way to finish the season than being victorious in Moscow," Pavlyuchenkova said. "I especially want to thank my family who have supported me here over the last week." Sevilla beat Elche 2-0 with second-half goals from Carlos Bacca and Kevin Gameiro to move up to second in La Liga while Tiago got the opener in Atletico Madrid's 2-0 win over Espanyol on Sunday. Deportivo la Coruna moved off the bottom of the table after Toche sealed a 3-0 win to dent Valencia's bright start to the season. Bacca finally ended the resistance from Elche when he knocked in a rebound on the hour after a save by goalkeeper Manu Herrera from a Gerard Deulofeu shot. As Elche pushed forward to get back into the game, the lively Denis Suarez broke down the left and crossed for Gameiro to head home. Sevilla have 19 points from eight games, a point more than Real Madrid who beat Levante 5-0 on Saturday. Barcelona lead the standings on 22 points following their 3-0 victory over Eibar. Valencia slipped to fourth, level with Atletico on 17 points. Atletico's Tiago leapt well to steer Gabi's cross into the top corner before the break against Espanyol and substitute Mario Suarez scored from close range in the 71st minute. Antoine Griezmann could have given them a more resounding win five minutes from the end but his shot came back off the outside of the post with keeper Kiko Casilla beaten. Diego Simeone's side have been seeking to get back on track and show the consistency that saw them win the championship but they have lacked the solidity in defence of last season. On Sunday they managed to keep a clean sheet following a 3-1 defeat at Valencia before the international break. 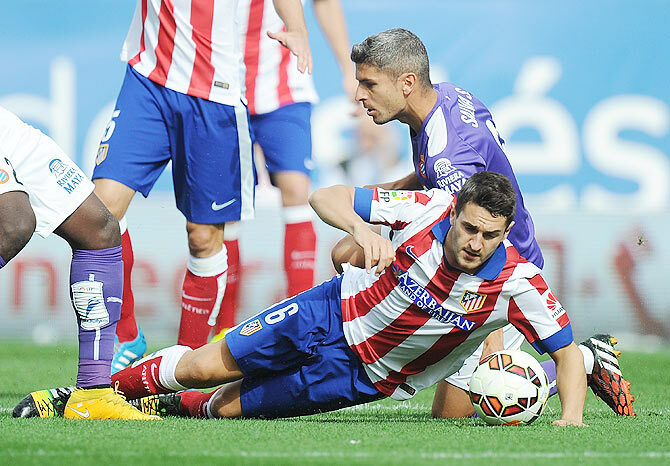 "I think the team did what it had to do and was in control," Simeone told a new conference. "We were playing in the opposition half with Raul (Garcia) and (Mario) Mandzukic in attack finding space as did Juanfran and Arda (Turan) on the wings. "We were patient and the goal came. In the second half we were even more dominant." Deportivo took the lead against Valencia with a scrappy own-goal from a corner after the ball first came off Shkodran Mustafi and then Jose Gaya on the line. Just before halftime a long punt downfield by Deportivo goalkeeper Fabricio found its way to Lucas Perez who finished clinically with an angled drive for their second. Toche then ran clear 10 minutes from time and slotted past keeper Yoel Rodriguez to wrap up a victory that moves Deportivo up to 15th in the 20-team standings. “It was a bad day, a very bad day, but that is not to say anything against the effort of the players,” Valencia coach Nuno Espirito Santo told a news conference. “When you look to get back into the game having gone behind you have to take risks and it can happen what took place. Inter Milan and Napoli served up 78 minutes of dismal football before bursting into life to share four goals in a breathless final 12 minutes as they drew 2-2 in Serie A on Sunday. Jose Callejon twice put Napoli in front, the second in the 90th minute, but Inter replied almost immediately each time, firstly through substitute Fredy Guarin and then Hernanes. The second goal was a huge relief for Inter coach Walter Mazzarri, whose position has become precarious after two straight three-goal defeats, although the grizzled coach was not there to see it, having been sent from the touchline for dissent. A spectacular own goal by Brazilian defender Rafael Marques, followed by a Keisuke Honda double gave AC Milan a 3-1 win at Verona while third-placed Sampdoria remain unbeaten despite throwing away a two-goal lead and drawing 2-2 at Cagliari. Champions Juventus, who dropped their first points in a 1-1 draw at Sassuolo on Saturday, lead with 19 points from seven games, one ahead of AS Roma, who beat Chievo 3-0, also on Saturday. Inter president, Indonesian business tycoon Erick Thohir, did little to ease Mazzarri's worries in a pre-match interview, telling the Mediaset channel: "I believe in this project, but let's see what happens in the next couple of games." Most of the match was sloppy and bad-tempered, with the players greeting almost every refereeing decision with howls of protest. Even when the game did come to life, it was courtesy of dreadful defending. Callejon fired Napoli ahead in the 79th minute after Inter defender Nemanja Vidic obligingly headed a long throw-in straight into his path and Guarin replied three minutes later when he was left unmarked at a corner. Napoli regained the lead when Callejon side-footed past Samir Handanovic after escaping the attention of the Inter defender only for Hernanes, completely unmarked, to reply with a header almost immediately to save Inter. Milan were sent on their way when Marques, facing his own goal and under no pressure when he tried to hoof away Ignazio Abete's cross, completely miskicked and sent a sliced volley whistling past his own goalkeeper Rafael in the 21st minute. Honda burst clear and sent a curling finish past Rafael six minutes later, then ran onto Adil Rami's through ball to prod home his sixth goal of the season after the break as Milan climbed to fourth with 14 points from seven games. Nicolas Lopez scored Verona's late consolation. At Cagliari's Stadio Sant'Elia, Manolo Gabbiadini and Pedro Obiang put Sampdoria in the driving seat but the game changed when Fabrizio Cacciatore gave away a penalty, was sent off and Danilo Avelar converted for the home side in the 59th minute. Cagliari took control and Marco Sau equalised with a low shot on the turn. Richmond Boakye scored Atalanta's first home goal of the season in their 1-0 win over Parma and promoted Palermo claimed their first victory of the campaign when a stoppage-time header from their Costa Rica defender Giancarlo Gonzalez gave them a 2-1 win over Cesena. Filip Djordjevic scored his fifth goal in three games to set Lazio on the way to a 2-0 win at Fiorentina. The visitors wasted so much time that the referee added on eight minutes of stoppage time, during which Senad Lulic added the second.